It's August, which means Summer is in full swing and barbecues are working overtime. Whether you consider yourself a novice griller or an accomplished barbecue baron, there is never a wrong time to brush up on your grilling skills. At AEI we understand both the importance of knowing how to work the grill, but also how crucial proper preparation can be. Below we have compiled some basic barbecue tips that we hope can assist you in taking your outdoor grilling to the next level! Make sure your grill is clean before starting. While for some dishes, having flavors leftover on the grill may be a welcomed addition to your palate, in most cases you will want to have the grates scrubbed before beginning a new meal. A sturdy metal brush is the most common tool used to clean the grates in between uses. A hotter grill makes it easier to scrape off any remaining food flakes. Don't abuse the meat. Avoid squishing the meat. The more you alter the shape of the meat being grilled the less flavor and moisture it will retain. Keep a spray bottle handy in case of flare-ups. While flames are completely necessary to cook the food properly, they can also char and burn if not watched carefully. A spray bottle filled with water allows you to control flare-ups without affecting the heat. Meat thermometers help. Even experienced cooks can be caught off guard by an undercooked burger. Some cooks touch the meat to determine how much longer to cook them, while others watch the color. Regardless, unless you are a very experienced cook, it can be hard to accurately read the meat’s temperature every time. A meat thermometer does the work for you, accurately, and they typically cost less than $20. Remember food continues to cook off the grill. Carryover cooking is a term that means your food continues to cook even after it has been removed from the grill. Food temperature rises slightly after being removed from the grill so don't cook those patties too much before taking them off. Rest all meat! Allow the meat to sit undisturbed after removing from your PGS grill. If given the time to rest the meat will retain its natural juices. This means a juicier and tastier burger. The time taken to rest will depend on its size. Steaks or chops should stand for about 5 minutes, while roasts typically need between 10-20 minutes of rest before serving. Cook meats with bones at higher heat. No one wants to eat meat covered in black char. For thicker meats with bones, such as chicken legs or ribeye, grill them on high heat then move to lower, indirect heat on the grill. This allows for the meat to be more evenly cooked without producing char on the bones. Keep it simple when serving a crowd. This is obviously a personal preference. When barbecuing with multiple protein options it may be best to invest in meats that cook in similar fashions. Trying to keep track of various cook times can easily be overwhelming for even the most attentive griller. Mix and match a variety of sides to offer up plenty of choices for friends and family. 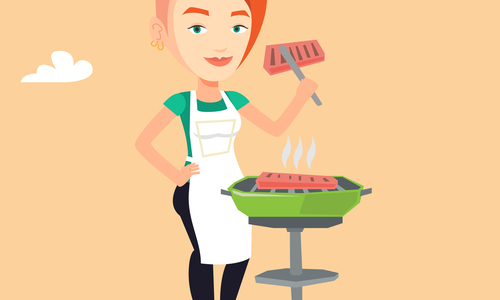 Propane and natural gas grills burn relatively clean. The main by-products of these types of grills are mostly water vapor and carbon dioxide. Charcoal, conversely, produces a variety of different molecules when burned, some of which can indeed land on your food and flavor it. As the fats burn up and drop onto the hot coals, they create new aromatic compounds that get deposited back onto your meat as you barbecue. When cooking high-heat foods such as steaks, burgers, fish, or pork chops, while applying the same heat output and cooking time, it can be difficult to tell the difference between meats cooked on charcoal or gas. For events where foods will be cooked longer and via indirect heat, like ribs or brisket, there will be a noticeably smokier flavor when cooked over charcoal. When you find yourself grilling over indirect heat, there's very little vaporization of drippings, so most of your smokey flavor is produced directly from the charcoal itself over the longer period of time it cooks.